It is early evening, and as I gaze across Cape Town’s harbour, a south-easterly wind picks up. The Cape Doctor, as it is known locally, is reputed to purify, as well as cool, the city’s summer air. In the distance is a historic grain silo, a towering structure of 42 vertical concrete tubes. The site has been the talk of the town since plans were announced 18 months ago to convert it into Africa’s largest art museum – and put South Africa’s mother city on the global art map. Excitement escalated when British starchitect Thomas Heatherwick unveiled plans to hollow out the structure and create a cathedral-like, light-filled atrium with nine floors of exhibition space, which will eventually house the Zeitz Museum of Contemporary Art Africa (Zeitz MOCAA) and international exhibitions. But there is more. An additional five floors will house a five-star hotel with a roof garden, bar and dining area with 360-degree views. When it opens at the end of 2016, The Silo hotel promises to be a paradigm of 21st-century Western Cape hospitality: world-class accommodation, food and wine, spectacular mountain scenery and an immersive contemporary art experience. 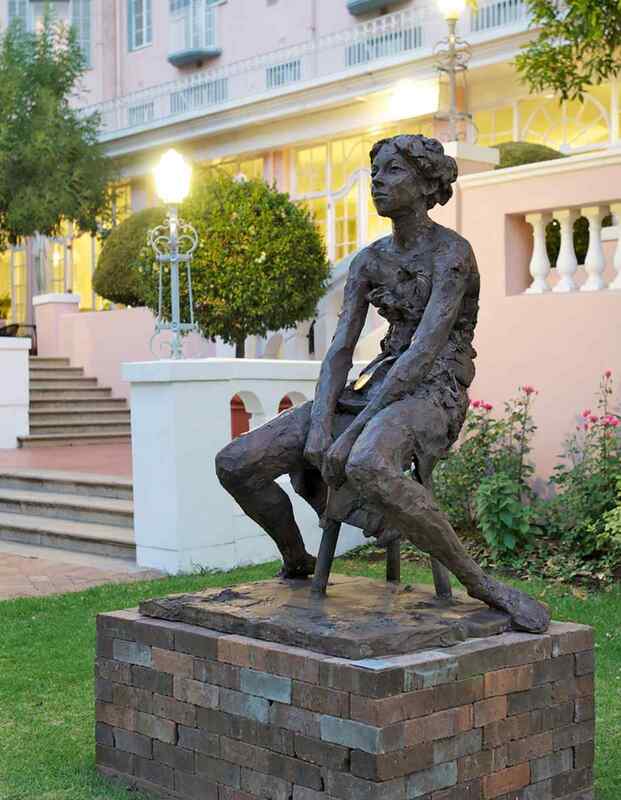 Even the Belmond Mount Nelson, Cape Town’s colonial-era matriarch hotel, with its insistently pink exterior, predominantly chintzy decor and legendary afternoon tea (so popular with locals that there are two afternoon sittings and a scaled-down morning service), is surrounding its guests with contemporary art. Lie by the heated outdoor pool or stroll the nine acres of English-style gardens and you will come across an eclectic display of contemporary sculptures as part of the hotel’s annual selling exhibition. There may be newer and more fashionable hotels in and around Cape Town, from the award-winning One & Only on the lively Victoria & Alfred Waterfront, to the small and ultra-chic Cape View Clifton and the art-filled Ellerman House; but Nellie, as it is fondly known here, has traditionally been the preferred address of visiting celebrities, politicians and heads of state – and where philosopher and author Laurens van der Post used to bring his young daughter Lucia (now our esteemed associate editor) for her birthday tea. Today, the hotel’s quirky, celestial-themed Planet Bar is another magnet for well-heeled locals who, in the summer months, spill out onto the terrace with their sundowners. Nor can Nellie’s location be bettered for a city-centric stopover. Despite the tranquillity of its gardens, it is just a few minutes’ walk from Government Avenue, a leafy walkway lined with the city’s best art galleries, museums and monuments. Of the rooms that have had a contemporary makeover, the eight historic cottages adjacent to a second, secluded adults-only pool are the chicest. While Cape Town, Table Mountain and the coastline offer ample diversions, for many visitors, the ultimate lure is the 200-plus vineyards that cover the verdant, rolling hills of the Western Cape, a region famed not only for scenic wine tours but also for its high concentration of stunning accommodations and stellar restaurants serving inventive farm- and forage-to-table cuisine (these days, at prices roughly half of what you’d pay in London – the rand has fallen by 60 per cent against sterling over the past five years). 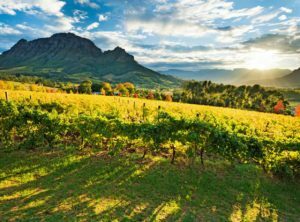 An hour’s drive along the motorway, at the head of a narrow, lush valley, is Franschhoek, Afrikaans for “French corner” and the smallest and prettiest of the Wineland towns, with white-painted homesteads dating back to the 1800s and some of the loveliest views. French Huguenots fled here from religious persecution in the late 17th century, reclaiming the land and planting vineyards, and the French influences are still evident in the town’s nomenclature and restaurant scene. Today, the 60-odd restaurants win so many accolades that Franschhoek is often referred to as the gourmet capital of the country. 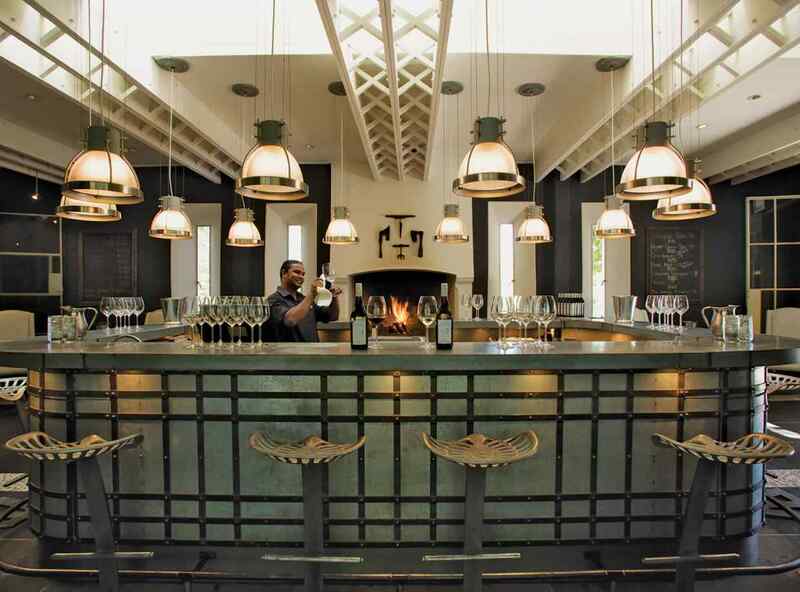 The immaculate Grande Provence wine estate on the northern perimeter of the town dates back to 1694 and, as well as offering seven beautifully designed rooms, has a restaurant that frequently features in South Africa’s top 10. I counted no fewer than 69 framed awards as I entered the elegant dining room, with its funky industrial bar, throne-like white leather chairs and inky-blue walls. Chef Darren Badenhorst’s intricate dishes reference the estate’s French heritage but add global accents; the highlight for me was the truffled green pea and pancetta risotto with smoked thyme and black pepper foam, served with an award-winning Grande Provence Chenin Voignier 2013. Here, as with many Cape wine estates, gratification of the senses goes beyond fine dining and fabulous vistas. Owner Alex van Heeren is an art lover, and his passion is evident in the gardens, where there is a continually evolving collection of monumental sculptures, and in the large gallery that adjoins the restaurant, where work by established and emerging South African artists is showcased. I fell in love with a large, figurative vessel by ceramicist Charmaine Haines, embellished with abstract and stylised motifs. 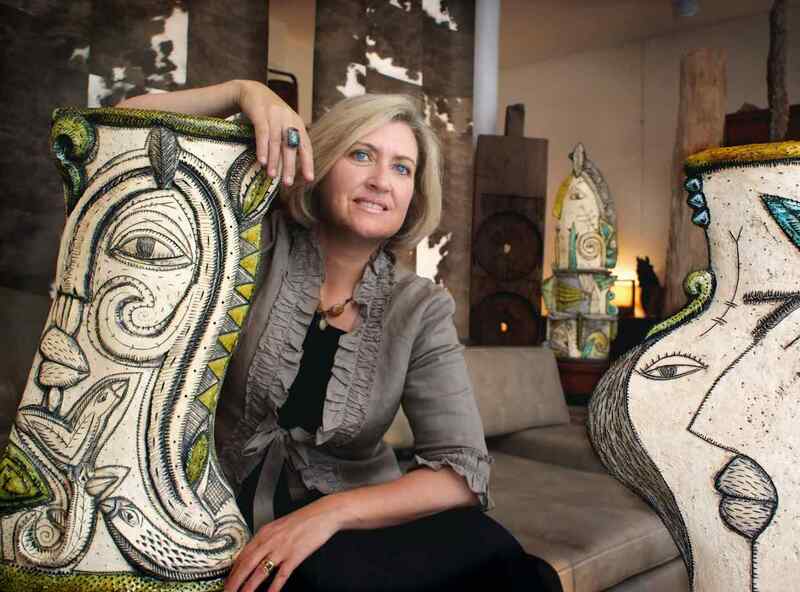 A few days before, I had bought one of her portrait wall plates from Art in the Forest, an excellent social-enterprise ceramic gallery in the upscale Cape Town suburb of Constantia. While the plate would slip easily into my hand luggage, this beautiful beast would need expert shipping. Art is also at the heart of the Delaire Graff Estate, high up on the pass between Franschhoek and Stellenbosch, which British fine-jeweller Laurence Graff bought on a business trip in 2003 after being shown it by an old friend. Although at the time Graff knew nothing about making wine, he remembered taking “one look at the landscape, the vista, the mountains and thinking that I had the opportunity to buy this piece of paradise… and within five minutes I’d made an offer”. The estate is now home to a boutique hotel of 10 lodges with double-height ceilings, vast glass‑fronted bedrooms, marble bathrooms, plunge pools, butler-serviced kitchens, David Collins Studio-designed interiors – and a serious spa. But we are here not to stay, rather to sample the estate’s exceptional wines over lunch and explore its public areas and gardens, which showcase Graff’s world-class collection of South African and international art. Above the reception desk is Sentinel, an immense and mesmerising portrait by Lionel Smit; and in the gardens, uplifting bronze statues by his father Anton Smit. An enigmatic bronze of a warrior on a chariot by Deborah Bell is visible from the glass-walled lobby, as are two life-size bronze cheetahs by local sculptor Dylan Lewis; others menace the grounds singly or in packs. 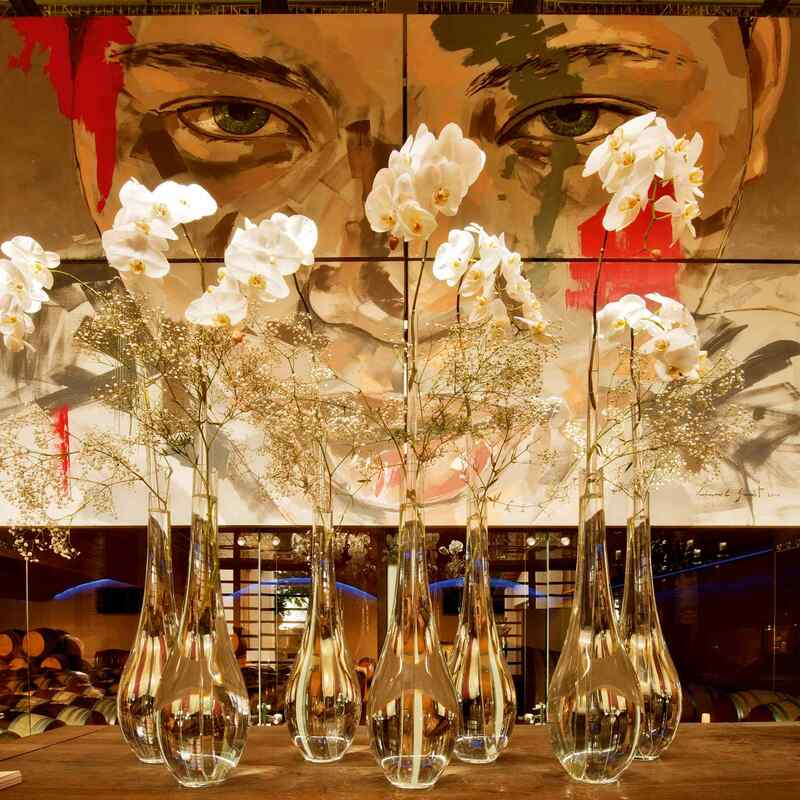 Elsewhere, walls are lined with paintings by William Kentridge, Kendell Geers and others too numerous to recall – so much to take in that we find ourselves late for our lunch at the main restaurant. Our table is on the terrace with magnificent views of the craggy peaks of the Simonsberg Mountains. We’re scheduled to visit the Rupert Museum of 20th century art after lunch and just have time for a glass of the estate’s Cap Classique sparkling wine before we opt for the pan-fried kingklip with cauliflower, caper berries and sultanas from the refreshingly uncomplicated menu. A glass of Delaire Graff Chardonnay 2013 (given a 91 rating by Robert Parker) is followed by the award-winning White Reserve 2012, a fruity Sauvignon Blanc-Semillon blend. Graff’s instant love affair with the Cape Winelands is hardly a unique story. 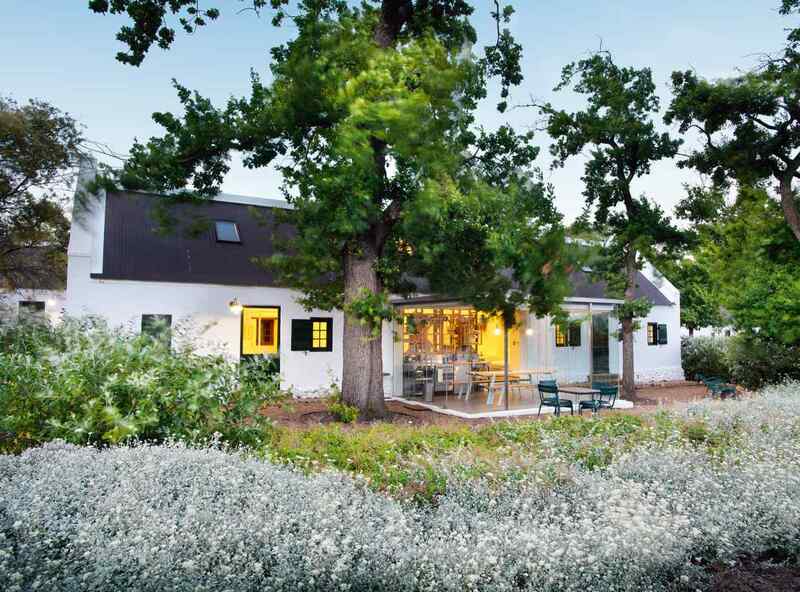 In 2006, German entrepreneur and art lover Michael Pawlowski came to Franschhoek for a holiday, fell in love with the valley and made it his home. As well as building a house for his family, he converted four adjoining 19th-century buildings on a working wine and plum farm into individually designed villas, each with its own pool, gardens and butler service, with the wonderful general manager Peggy Klement on hand to ensure everything runs smoothly. (Klement’s husband Larry Gould is the Winelands’ resident golfing expert and happy to recommend courses in the area.) Collectively the villas are called La Clé des Montagnes, and with good reason. The views across the vineyards to the Simonsberg Mountains are idyllic, and yet the pavement café society of Franschhoek is less than 10 minutes’ walk away. Art lovers will be drawn to the two-bedroom villa called La Galerie, with its entrance hall lined with paintings by contemporary Swedish artist Bengst Karl Erik Lindström, but all are sumptuously furnished, with characterful curios and distinctive decorative flourishes. We stayed in the baronial splendour of the three-bedroom La Grange, with its double-height ceilings, giant stone fireplace and open-plan, Victorian-inspired kitchen. But I never became acquainted with the industrial quality coffee machine or the contents of the cupboards, because butlers Frank and John conjured up breakfast on our expansive veranda, served drinks and canapés when we entertained friends and offered to cook a braai (meat barbecue) on our last day. Then, on the morning of our departure, we discovered they had washed our car. Suffice to say, it was a wrench to leave; how I envied the French couple who had rented sister property Le Manoir for a month. This is glamorous, grown-up luxury on a grand scale, but one that never translates into stiff formality. Within hours of arrival I feel like the privileged house guest of a generous and relaxed host, with legions of attentive but unobtrusive staff. Tea and coffee are served from vintage china; there’s a decanter of sherry on our dressing table and an honesty bar in the library. Should a guest forget her reading glasses, there’s a tray of varying magnifications – a typically thoughtful touch by La Residence’s general manager Edward Morton. And temptingly, the doors of unoccupied rooms are left open so that we can explore beyond the public areas. Our suite is part-treasure trove, part-art gallery. Above our bed is an oil-on-canvas by South African artist Sasha Hartslief; in our bathroom are paintings by fellow countrymen Hennie Niemann Sr and Claire Berlein. A book on the Bidens’ art collection can be found in the vaulted main hall, but the real pleasure – as at the Delaire Graff Estate – is seeing it incorporated effortlessly into such joyous surroundings. While La Residence is the embodiment of Liz Biden’s fertile imagination and decorating flair, Babylonstoren, just outside the Franschhoek Valley, is rooted in rustic authenticity, albeit with touches of modernist chic. 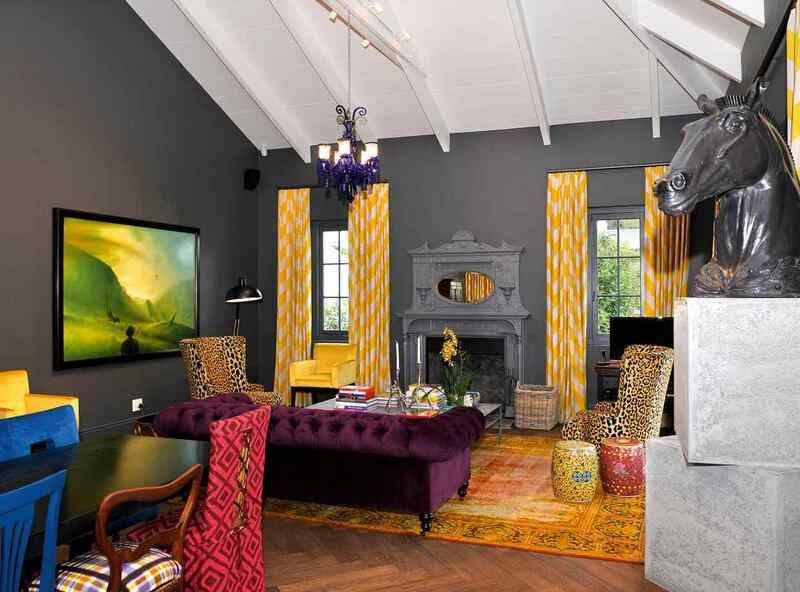 The handsome 17th-century Cape Dutch manor house was transformed by owner Karen Roos, a former editor of South African Elle Decoration and wife of media mogul Koos Bekker, who bought the property in 2005 as a retreat. The couple built guest accommodation in the style of one- and two-bedroom labourers’ cottages (the latter with glass extensions housing well‑equipped kitchen/diners) and opened them to the public in 2010. They make a great base for families: bikes are available for exploring the area, which includes a dam and boathouse with canoes. There’s also a small pool, spa and gym. 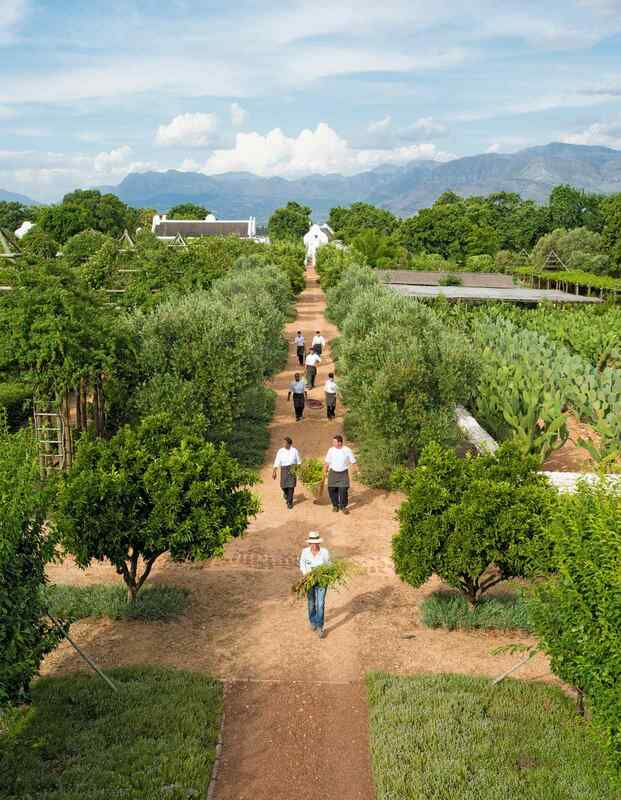 At Babylonstoren’s heart is a meticulously landscaped kitchen garden of extraordinary scale and beauty. The focus of the planting is variety rather than yield, and head gardener Gundula’s fascinating tour along myrtle-hedged paths takes in beehives, birdhouses, a lotus pond, a camomile lawn, a prickly-pear maze and more than 300 different edible plant varieties. All of them will appear at some point in the year in one of the estate’s two restaurants. Babel is in a former cattle shed, with the menu written on a white tiled wall dominated by an oversized image of a bull’s head. It’s the perfect lunch spot for intensely fresh ingredients prepared in adventurous combinations. I grazed on one of the restaurant’s colour-coded salads (my “green” salad included gorgonzola yoghurt cheese wrapped in baby vine leaves and a salsa of fig preserve, toasted macadamia nuts, prickly pear leaf and avocado) washed down with a crisp Babylonstoren Chenin Blanc. Dinner sees a very pared‑down menu at Babel and The Bakery, its more casual sister restaurant, which open on different nights. 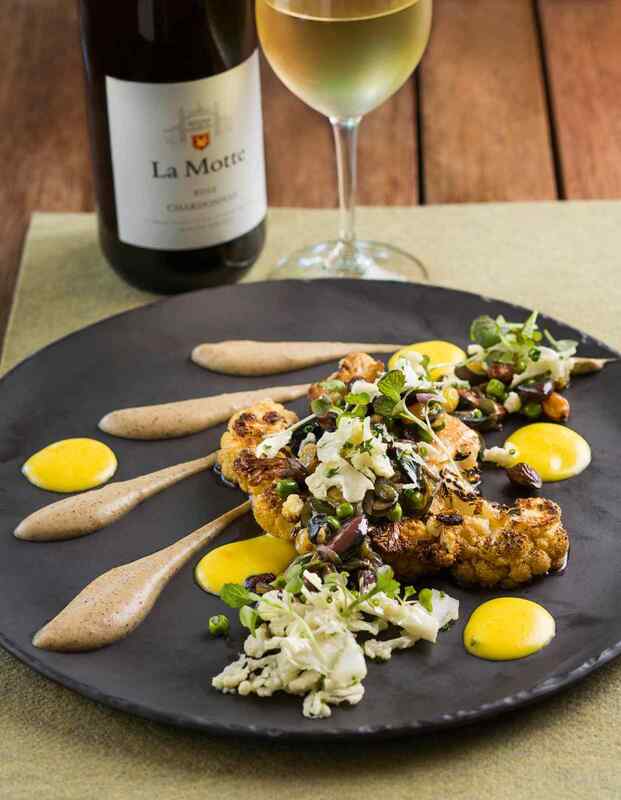 We had an excellent lunch at La Motte Estate, where award-winning La Motte Pierneef wines accompanied modern interpretations of traditional Winelands dishes. 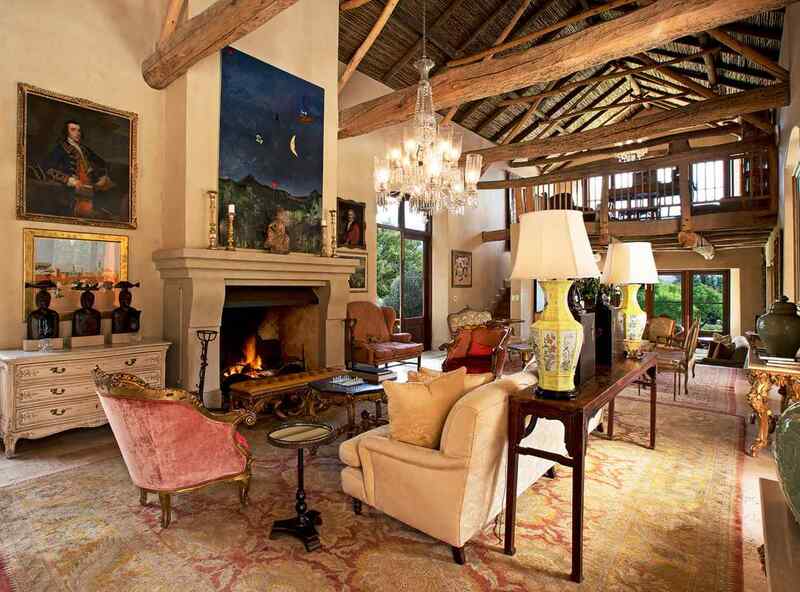 The estate was bought by the late industrialist and avid art collector Dr Anton Rupert and is currently owned by his daughter, leading South African mezzo-soprano Hanneli Rupert-Koegelenberg (sister of Johann Rupert, chairman of luxury goods conglomerate Richemont) and managed by her husband Hein. A small art museum includes a permanent exhibition of the work of renowned South African landscape artist Jacob Hendrik Pierneef. Art, food, wine: it seems the three are inseparable in this French corner of South Africa in a Switzerland-like setting. Back home in England, as I unpack my oversized Charmaine Hayes ceramic from its crate, I ponder where it will be showcased over a particularly fine glass of Delaire Graff Cabernet Sauvignon 2012.